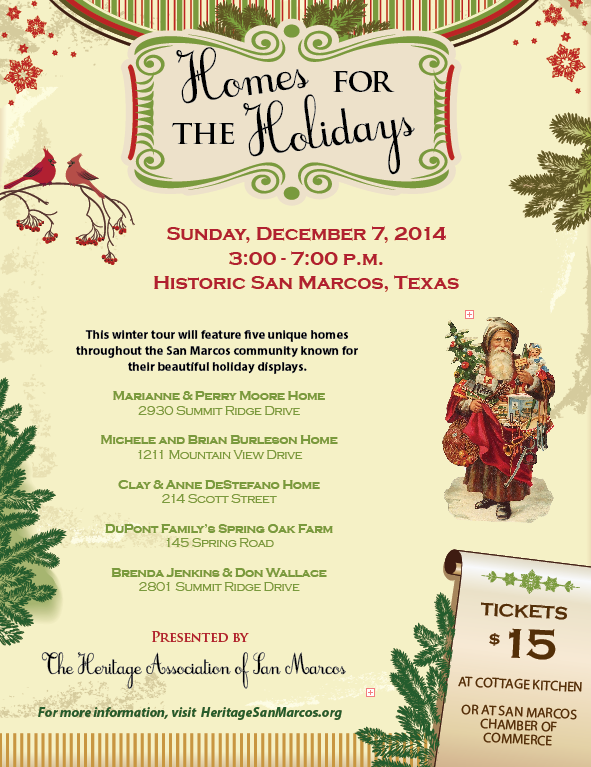 Plans are well underway for the Heritage Association of San Marcos’ Homes for the Holidays Tour, slated for Sun., Dec. 7 from 3 – 7 p.m. The tour will feature five unique homes throughout the San Marcos community known for their beautiful holiday displays. None are located in the official San Marcos Heritage District and that’s by design according to one of the organizers. “Since the spring Tour always features heritage homes, we wanted to give tour goers a chance to see a broader view of San Marcos – beyond the Heritage District – and, in turn, get to experience different architectural styles on the tour,” said Marianne Moore, Holiday Home Tour Chair. Moore’s home, which she shares with her husband Perry, located at 2930 Summit Ridge Drive will be one of three featured in the Willow Creek neighborhood. The home of Brenda Jenkins and Don Wallace at 2801 Summit Ridge Drive will be the second and Michele and Brian Burleson’s at 1211 Mountain View Drive will be the third. The downtown site to be featured is 214 Scott Street, owned by Anne and Clay DeStefano and Spring Oak Farm, owned by the DuPont family will bring tour goers to the north side of town to 145 Spring Road. Further plans call for each of the Tour Sites to feature some sort of holiday music and special holiday-inspired foods and/ or beverages. The 3-7 p.m. window for the Tour is designed to give tour goers a chance to enjoy individual lighted displays on homes as they drive from one location to the next. Discounted, $10 tickets were pre-sold as a package deal with the spring Grit & Grace Tour but individual tickets may now be purchased for $15 on Friday’s during Cottage Kitchen Luncheons from 11a.m- 1p.m beginning Fri. Oct. 31 and weekdays from 9a.- 5p. at the Sac Marcos Chamber of Commerce. If you pre-purchased a ticket, the Heritage Association will be contacting you in advance of the tour. Watch for more information on the tour, including more about the homes and mini-previews of some of the displays in this publication, on Facebook or @ www.HeritageSanMarcos.org. tree. Also featured will be a nativity collection. which requires navigating approx. 20 stairs. this home also features separate Santa, Nativity, Reindeer and Snowmen collections. reminders of holidays past, and all the charm of Christmas in the country.